DALLAS - Feb. 13, 2019 - PRLog -- In Dallas County, an estimated 19,000 people are living with HIV/AIDS, which represents a 39 percent increase over the past nine years with Dallas still ranked as the #1 city in the State of Texas with the highest rates of new HIV infections. 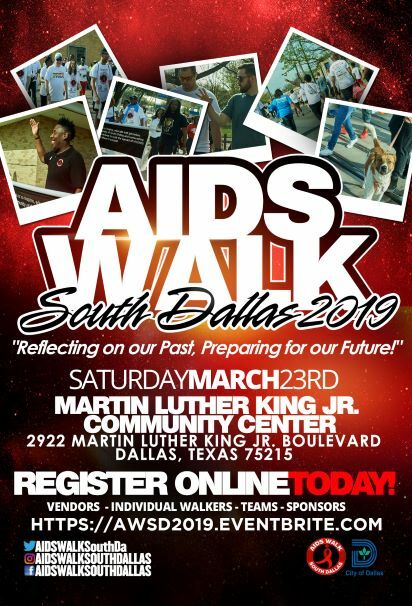 On Saturday, March 23, 2019 AIDS Walk South Dallas will celebrate 9 years with a 5K walk/run at Martin Luther King Jr. Community Center, 2922 Martin Luther King Jr. Boulevard, Dallas, Texas 75215. The walk starts at 10:00AM and registration can be done at the walk beginning at 8:00AM or in advance online at https://awsd2019.eventbrite.com with FREE lunch provided to all participants generously sponsored by Chef Patrick Whitfield and The Covenant Catering Service. "It is an honor to support such a great organization and give back to the community. As long as the walk exists, we will make sure everyone is blessed with a great meal every year. ", said Chef Patrick Whitfield. As a 501(c)(3) nonprofit organization, donations are tax-deductible and all funds benefit the programs and services of AIDS Walk South Dallas, Inc.
"The selection of Judge Clay Jenkins as the Community Ambassador and Robert McGee as the LIFE Ambassador, an African-American male living with HIV for the last 15 years reinforces our goal as an organization to always exemplify inclusion, diversity and show what real community looks like as we prepare for a future of zero HIV infections", said, Auntjuan Wiley, AWSD Event Chair. "The support we receive from the community shows a shared commitment and true passion to have an effect on the lives of people impacted by HIV and AIDS, and it's much appreciated," said Auntjuan Wiley, AWSD Event Chair. For more information about AIDS Walk South Dallas please visit www.aidswalksouthdallas.com . Sponsorship and vendor opportunities are still available. : AIDS Walk South Dallas, Inc.
Join Us for 8 Years of Education, Awareness and Our Goal to "End AIDS Together"